But the experiment is already expanding across the breadth of China. At a conference back in June — a video conference, no less — Chen Yixin (陈一新), the director of the Central Political and Legal Affairs Commission, urged the rapid and full implementation of what the Chinese Communist Party calls “Project Dazzling Snow” (雪亮工程). Chen spoke in glowing terms of the project, a comprehensive video surveillance network intended to cover communities in rural China down to the village level, as a “thousand-mile eye” (千里眼) protecting the security of the people. When it was first approved by the Central Committee of the Chinese Communist Party back in 2016, “Project Dazzling Snow” was envisioned as having “full geographic coverage, full network sharing, full time coverage, and full operational control,” meaning that the system would be nationwide, capture every nook and cranny with the exception perhaps of private homes, and would be readily accessible to law enforcement with 24/7 data — at the push of a button, to use an old-fashioned term. But how did such a delightful image, that of glistening and crystalline snow, come to describe a project that to a great many people outside of China’s control obsessed political culture must seem a devilish ambition? In Chinese, the phrase “dazzling snow” refers to brightness and clarity. In the 1940s, the phrase was most usually associated in discourse of the Chinese Communist Party with words like “sword” (刀剑) and “eyes” (眼睛). For example, there were phrases like, “sword as dazzling as snow” (雪亮的战刀), and “the eyes of the people are as dazzling as snow” — the latter phrase meaning that China’s masses are discerning, or penetrating. In fact, the phrase “The eyes of the people are as dazzling as snow” has long been a standard within the official Party media in China. It has been used to declare China’s resistance against imperialism, against the Kuomintang, and in support of class struggle. 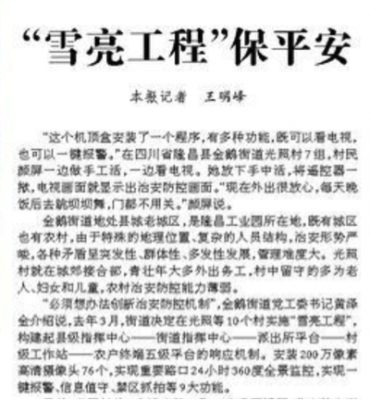 The image below is of a 1955 report in the People’s Daily on the suppression of the so-called “Hu Feng Counter-Revolutionary Clique,” referring to the campaign launched against the writer Hu Feng, who argued among other things that writers should have autonomy and not be directed by politicians. 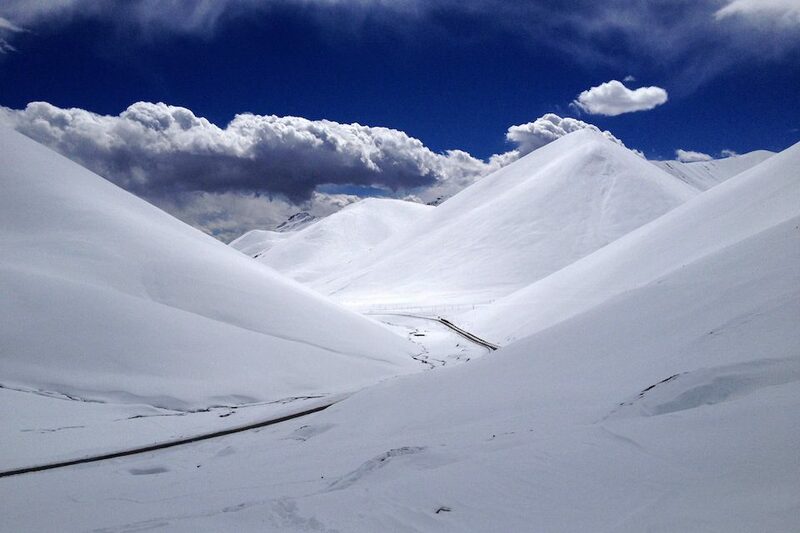 The name “Project Dazzling Snow” derives directly from “the eyes of the people are as dazzling as snow.” The project first emerged under this name in Sichuan province. By September 2015, when the National Development and Reform Commission, the Central Public Security Comprehensive Management Commission and other departments jointly issued an “Opinion” on increasing nationwide video surveillance for public security reasons, the phrase had come into use across the country. Finally, in January this year, the phrase “Project Dazzling Show” entered a Number 1 Central Document (中央一号文件) for the first time, being mentioned in a document called “Opinion from the Central Committee of the CCP and the State Council Concerning Implementation of the Village Revitalization Strategy” (中共中央国务院关于实施乡村振兴战略的意见). 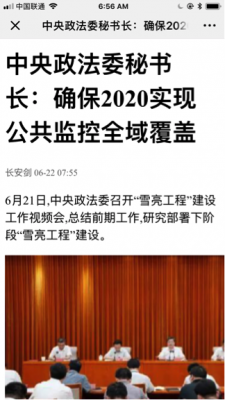 The coming of age in the state media of “Project Dazzling Snow” happened more than a year ago, on June 14, 2017, as the phrase appeared for the first time in the Party’s official People’s Daily . The People’s Daily report dealt with implementation of video surveillance in the Jin’e Subdistrict of Longchang County in Sichuan province, where 10 villages were brought into the new system of “Project Dazzling Snow.” The article described the set up of “command centers” at the county and subdistrict levels, a “platform” at the level of each local police station, and a “[computer] workstation” (工作站) in each village. All of the major streets and roads, said the report, were covered by 24-hour, 360-degree video surveillance.